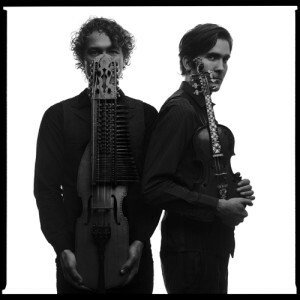 Two musicians, two countries, two instruments and all together 25 strings! “The Nordic sound. Here it is” Aftonbladet. Rydvall/Mjelva is an unusual and inspired duo collaboration between two folk musicians, one Swedish and one Norwegian. Erik Rydvall on keyed fiddle and Olav Luksengård Mjelva on Hardanger fiddle are both among the foremost folk musicians of their generation. Two inquisitive musicians with solid roots in their own traditions. The repertoires and performance styles of these two instruments are fundamentally very different, but these two musicians manage to make the combination sound both natural and intriguing. The music is evocative, catchy and danceable, and their collaboration really makes the sparks fly. The Hardanger fiddle and the keyed fiddle have rarely been played together in a duo format. Their debut album “Isbrytaren” (“The Icebreaker”) was released to critical acclaim in 2013 and was awarded with both the Norwegian Folkelarm prize and “Album of the year” at the Swedish Folk and World music awards. “Isbrytaren” was also nominated to a norweigan grammy (Spellemann) as well as “Manifestpriset” in Sweden.